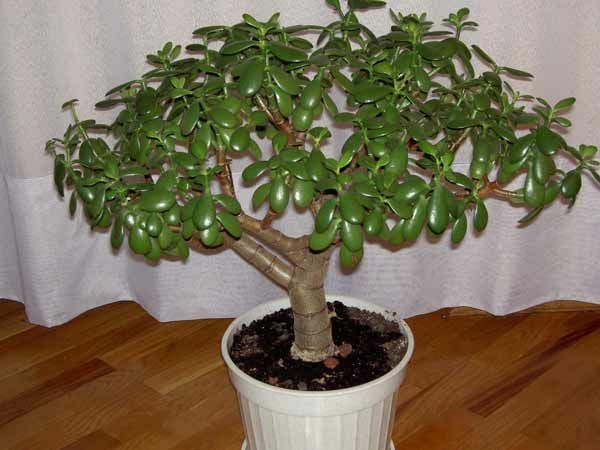 The legendary money tree, or as it is called, jade, is one of the most popular and beloved in the nation houseplants. It is very unpretentious to the conditions of detention, does not require any special care, can easily take root and quickly gives shoots. To care for him will even the most inexperienced grower. And yet, money tree, as well as any ornamental plant, needs certain care. In particular, timely pruning and topping. Pruning is necessary for a plant to form a beautiful rounded crown. In addition, it effectively stimulates the growth of young shoots. However, it should be done properly and in a certain period of time, otherwise you may damage the flower. Pruning technique depends on the age and condition of the plant. Young money tree is not cut, but pinch. Topping can slow its rapid growth in height and encourages the development of lateral shoots. Pinch jade need in the following way: pull the upper part of the main shoot and examine it carefully. Among the top rosettes of leaves you will see the growth point is a small Bud located at the top of the stalk. It unfolds the new young leaves, and escape on the sky high. Carefully take this kidney the nails so as not to offend while surrounding leaves. Can be used as a tool of the scissors. If you pinch out the plant with your fingers first grasp nails for the kidney and tsepinite its twisting motion. After a while you will notice that the flower awoke and went into the growth of lateral buds, located below the barrel. If the plant has several strong side shoots, and you want to form a rounded crown, and you have pinched together and the buds of growth on the tops of side shoots. As a result, they will increasingly grow outwards, releasing more leaves along the whole length of the stalk. To give a nice neat shape Mature plants will need a pruning. To make it better garden shears or a sharp steel knife. Before you start cutting, look at the plant from a distance and imagine how it should look in the result, which branches seem particularly superfluous. Then start to trim the top shoots and side branches, giving the crown a form of a ball. Try to cut took place a half-inch above dormant buds. Then cropping will have a stimulating effect, and the plant will start to grow more actively. It is advisable to follow a certain sequence of pruning depending on the breed and condition of the plantings. Pruning Apple trees, as more resistant to adverse environmental conditions, it is possible to start and finish this work. Trees planted in the previous autumn, should be cut before the SAP flow. Pruning fruit trees – is primarily creativity, you decide what will be your garden, there are many recommended forms but must first consider the varietal feature of the wood and the climatic conditions of your region. 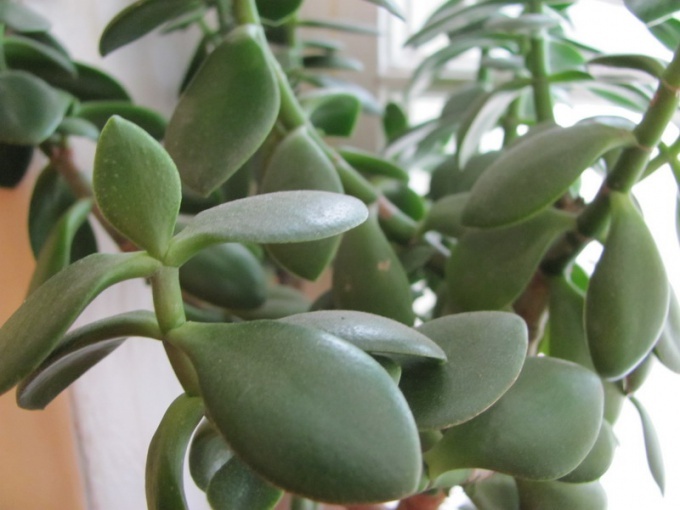 Many believe that crassula, aka jade, aka money tree – brings home wealth and good luck. But even if this is not so, crassula can be a great decoration of the interior. Of course, it should be well-groomed and well-formed. To form a crown must, from the outset, once the process will go on and will reach the desired height. Otherwise branches will grow unevenly, and tree, reaching a significant size, may simply roll over. Plant stalk. Money tree reproduces the most common for indoor plants way. Broken off a sprig, put in the water in which it sets roots. After that she should be locked up. Money tree is unpretentious, grows well in any soil, but loves the water and light. Decide what height tree you need. It can be quite a small tree with a height of 15-20 cm to make it higher. Remember that even formed Bush will still be slightly higher than the first nipping. Crassula can be formed in single or multiple trunks, but in the second method the crown can become too thick. When the stem reaches the desired height, simply break off the tip. This is done simply with nails. No additional procedures, like seeding the ashes, in this case not required. Do not expect that the side shoots will start to grow immediately, it will take some time, sometimes several weeks. Side shoots can be a lot. Let's see what you need. Simply break off the excess. Large crassula on the barrel there are additional buds with them, too, begin to grow shoots. They need to be carefully to break off. 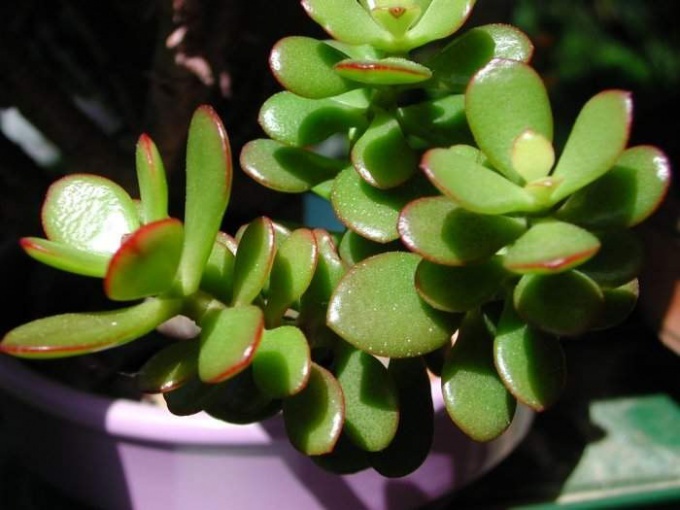 Crassula does not require treatment "of wounds". Places where there were broken stems, very quickly overgrown by themselves. It may happen that you have to remove a rather thick branch. It is better to cut with a scalpel or other sharp knife. Jade loves the light and the water, but it should be a period of relative calm. In winter, watering it 1-2 times a week. 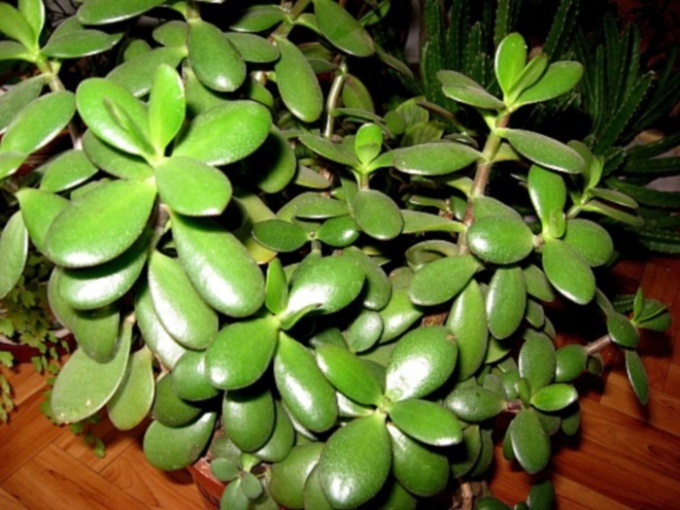 Jade or crassula called "money tree". Its leaflets are shaped like coins. There is a belief that if you bury at the bottom of earthen clod of the plant the coin, then good luck and wealth will accompany the person caring for jade. Can you believe this or not believe it, but if there is extra metal coin came time to transplant, put a coin in the pot. From the "money tree" best form namely wood, not green thickets. Giving a beautiful shape jade, consider the size of the pot, control the size of the branches, watering and lighting. Put in flower pot only one process, then we can form a pretty thick trunk. Jade can be stuck directly into the ground without waiting for the roots in the water. The diameter of the pot should be sized to match the crown. This question becomes relevant when the crown reaches the lush sizes. Otherwise crassula will fall over on its side. Use shallow flower pots. When the roots of the "money tree" is getting crowded, it slows the growth, while the trunk becomes thicker and better stiffens. And because the plant can be transplanted frequently, use this time to strengthen the trunk. Crassula put on a well-lit place. She loves sunlight, but not direct rays. If the leaves are very red, they came under direct sun. 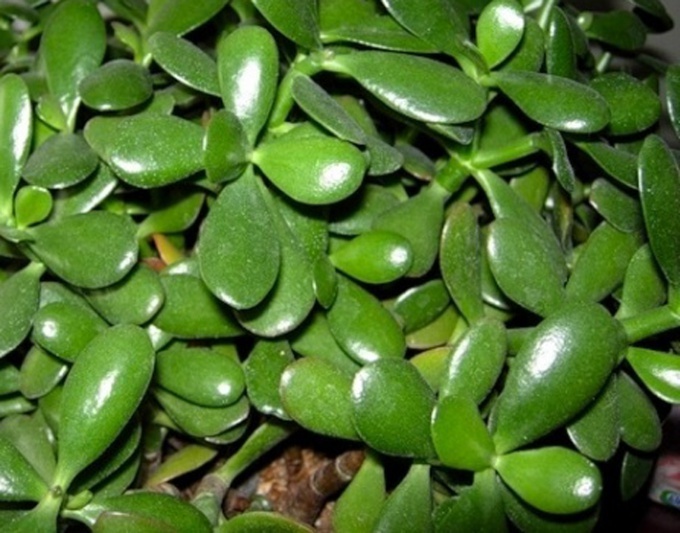 Slightly pricenice plant, while jade is not suffered burns. In summer take the "money tree" in the fresh air. It grows well on the balcony or in the open ground in the country. Make artificial lighting for crassula winter. If the sill is dark, the plant begins to elongate, the branches will be thin and frail will start to break off under its own weight. Water the plant gently. Watch carefully so that the trunk at the point of contact with the ground does not rot. In winter, watering should be sparse. Match crown "money tree". Branch plants though look strong, actually very fragile. Heavy plump leaves and getting at them can break off, if not in time to make the topping. Make topping when the twig grew four pairs of leaves. Wait until new buds on the twig between the leaves, fingernails or tweezers remove it. The young shoots are easily detached. The branch should start to give the side branches. You may have to be deleted again. A tree can not immediately understand what is required of him. If you got a very neglected plant with long drooping branches, which need to radically trim the stiff areas, use a razor or thin knife. Just don't damage the edge of the neighboring branches. At this distance will remain stumps. They need to sprinkle the crushed activated carbon. Pinch crassula at any time of the year when the need arises. Small tree with a beautiful crown coins – leaves will decorate any interior. If you do not care about the formation of the crown money tree, the plant will stretch, become ugly and untidy. Branches will be heavy, and later break under the weight of succulent leaves. To begin to form a crown you need to immediately after the plant will take root and begin to grow actively. Pot money tree must be the same size as that in the future the plant roots kept the tree itself. A small pot will quickly fill with roots, and hence the tree trunk before will start to stiffen. For proper formation of the crown of the trees should start to pinch after four pairs of leaves on the stalk. Fifth a kidney removed, cut processed activated charcoal or ash. Instead of this the kidneys have to get two new kidneys. So begins branching. If instead you cut the buds went out again one, then repeat the procedure with the topping. For a nice crown is important good lighting in the room. Money tree loves the sun, but not direct sunlight, they can burn the plant. If the leaves become red, it is necessary to make a shade tree. A pot of money tree must be periodically rotated, to crown was the same on all sides. The branches of money trees are very fragile, so need time to pinch off excess parts of the plant. If this is not done, the tree is very much branched, and the branches will begin to break down. If your tree initially incorrectly divided, then it is necessary to trim these branches to the trunk, leaving a few leaves. Because of branching, the type of "slingshot" in the future will ressuply the barrel in half. These cut shoots can be re-planted. The young plants a tree trunk covered with leaves. No need to remove them, they will subside themselves with time.